About three years ago, I could only have described my relationship with God as “frustrating.” During this season, whenever I heard people talk about intimacy with God, my gut reaction was anger and judgment. First, I was angry that whatever they meant by “intimacy,” I didn’t have it. So, what do you do when someone has something you want, but you can’t seem to have it? You judge them, right? Is that just me? 😛 I did judge them, saying things like, “they’re probably overly emotional nancy-boy Christians. Those kinds of Christians who make the faith all about how they feel. They probably checked their brain at the door of the church before they came in!” Ouch, it hurts to read that, but it was true. I had finally gotten to the heart of what I had been struggling with. I had, without realizing it, always felt that God was just putting up with me. And I was grateful…but I really wanted more. I didn’t want to just feel tolerated. I wanted communion with God. I wanted to experience and believe, deep down, that He loved me. And that discovery is at the heart of this little blog series. You see, there is a direct connection between your view of God and the richness of your fellowship with Him, between your understanding of Jesus and how you feel about him. And that should make sense. We know, or should know, that prayer isn’t this sort of activity that we master, like hitting a baseball, or computer programming, or knitting a scarf. Right? It’s relationship; it’s communion! Think about another important relationship in your – your spouse, parent, friend, co-worker, etc. If what you believe about their character is faulty, how big of a difference would that make in your relationship. If you believed that your spouse loathed you, that your boss wanted to fire you, that your kid thought you were a cotton-headed ninnymuggin…those beliefs would affect your relationship, especially if they are untrue! Right? Think how much more this is true about God! So, I hope that the next few posts help us clarify both what he is like AND what that means for us! OK, I felt compelled to write this entry for two reasons. First, to point you to a few wonderful folks that have had a lot of influence on me of late, whether authors, bloggers, speakers, etc. Second, I almost feel like I need to do this as a sort of disclaimer! Some of these folks have so shaped my thinking that I can hardly look at any issue without their influence being apparent (at least to me), even when I’m talking about issues that I haven’t heard them address specifically. So, this serves sort of as a blanket footnote or acknowledgment. I do try to cite them when I quote directly or when I’m sharing something that has come straight from them in one way or another, but I may miss one here or there. And, honestly, again, I see their influence in almost every post, even when I’m not quoting them, so much of the good in my writing and none of the bad can be attributed to them. So, read them, listen to them, enjoy them…better yet, enjoy the Jesus they have helped me learn to enjoy! 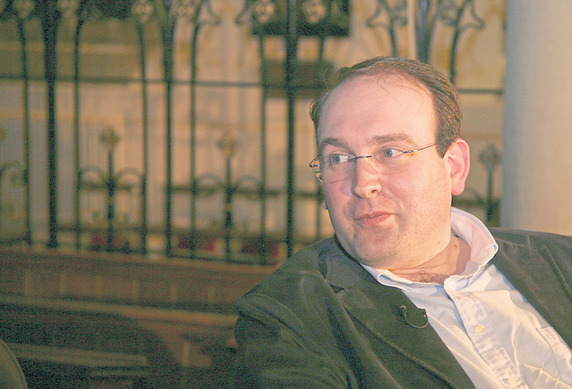 Michael Reeves is the principal of Union, a ministry based in Oxford, England that is doing fantastic work. Seriously, you need to check them out. Mike has, first and foremost, helped me think about God. If I am ever trying to clarify who God is in order to help us understand anything else rightly, it’s primarily due to Mike’s influence. If I’m writing about the Trinity, God’s Glory, the Reformation (and Reformed Theology), Church History, or the Difference Jesus makes, he’s had a huge role in that. I know Mike slightly, mostly through his works, but looking forward to getting to know him more in the days/years ahead. Check out his resources at http://www.uniontheology.org and books at Amazon. Glen Scrivener is an evangelist based in Eastbourne, England. He leads a ministry called Speak Life. I love how they are working to help the church be more winsome and more Biblical in their evangelism. Glen, like Mike, has had a great impact on me in learning to clarify who God is and who He is not, and enjoying Him. He’s also been a major encouragement in my grasping how much the Old Testament is all about Jesus, and the Word exists to help us encounter Jesus! I love his Youtube journey through the Bible called Reading Between the Lines. Finally, he’s helped me continue to clarify my understanding of mission and what it is God is doing in the world. He blogs at christthetruth.net. So, if I’m talking about those issues…even if I’m not quoting these 2 men, you can bet that they have significantly influenced what you’re hearing. Which means that you should be really be reading what they are writing and listening to what they are teaching instead of me. But if you want to keep hanging out around here, you are very welcome! Let me take all this just one step further. We could look at all this and say, “Hmm, the God of the Bible, at his core, is a self-giving God. That’s awesome. So, he’s willing to be merciful. It’s in his nature, sort of like a benevolent King, handing out bread, who is good and kind.” We’ve sinned, but he’s merciful, so he forgives. But, does King Jesus just say, “I think you guys are OK people, so I’ll die so that you can go to heaven…I’ll forgive you”? OR “You’re not too good, but I’m gracious, so you’re forgiven”? Does he want to just give us heaven? Does He just want to be nice to us? Absolutely not! He wants to give us HIMSELF! And He wants us FOR Himself. The Gospel is much less about what God wants to save us from, though that’s part of it, and it’s much more about what He’s saving us for!!! For Himself. He wants us to be with HIM! Look again at John 17. Jesus says that the FATHER loves us: 22 The glory that you have given me I have given to them, that they may be one even as we are one, 23 I in them and you in me, that they may become perfectly one, so that the world may know that you sent me and loved them even as you loved me. JESUS wants to be with us: 24 Father, I desire that they also, whom you have given me, may be with me where I am, to see my glory that you have given me because you loved me before the foundation of the world. We do not have a contract God, lobbing demands from a distance, seeing how much work, sweat, and sacrifice he can squeeze out of us. We don’t even have just a nice God who’s willing to overlook offenses. No, we have a King that came and was pressed out, under the judgment of His Loving Father IN ORDER TO BE WITH US. Oh, what a King! And friends, he loves you. His heart is warm towards you. It overflows with affection and tenderness for you. So, how ought we to respond? We should love him. What more could you want from a King? If you are a Christian, how long have you lived under the weight of thinking that you still owe God something, that he’s still expecting something from you? Perhaps you wake up in the morning and think, “Oh, I better pray and read my Bible so that God will be pleased with me.” It’s SOOOO easy for us to slip into this YOYO mentality that His love depends on how well I’m doing. He loves me, he loves me not, he loves me, he loves me not. No no no no no no no no. You can’t do it for Jesus. Jesus has already done it for you. It is finished. Your CHAMPION has won! He’s secured the victory, and just like the Israelite army did when David beat Goliath, you simply get to enjoy being IN Christ, sharing in HIS victory. So, what’s happening here? Well, we’re looking for a King. We’re looking for someone who has authority to unroll the rest of history. Particularly, someone who can usher in the New Creation. The 7 seals do point to perfection, but primarily because of the first use of 7 in the Bible, the perfect creation in Genesis 1 where, through his Word, God transforms a chaotic void into a very good creation! The person we’re looking for can bring in, by their authority, the perfect New Creation. Luckily, a worthy one appears. The Lion of Judah (kingship is promised to Judah’s descendant forever in Gen 49.8-12), who also happens to be the Root of David (the coming, promised Davidic King!) has conquered! So, He can open the seals, He can rule the rest of history! Where do I get that idea of authority or ruling? Well, besides the reference to Judah and David, we’ll see it in this passage in a moment, but let’s look at another passage that is recording this same scene – Daniel 7. 9 “As I looked, thrones were placed, and the Ancient of Days took his seat; and the books were opened. Look at that. We have the same heavenly throneroom. We have one seated on the throne, and we have books (SCROLLS of course). And in each, one approaches the throne, but in this Daniel passage we see what is given over to Him…Dominion, Glory, Kingdom!!! The right to rule all things forever! Now, as we look back at Revelation 5, we’ll get a little more detail to round out our picture. Particularly, WHY IS THIS LION-KING, THIS SON OF MAN FIT TO BE KING FOREVER? Look at this! Wow! You are worthy FOR YOU WERE SLAIN!!! Because you gave your life as a sacrifice! To redeem the lost. You gave your life for theirs! Remember, two posts back we saw that because God’s VERY NATURE is self-giving, self-sharing, self-sacrificing, that is also how He rules…it captures the nature of His dominion. We saw last post that David demonstrates this in his self-sacrificing behavior in the David and Goliath story (of course, he does a bad job of this in the whole Uriah and Bathsheba incident). In this current post, we want to learn the same lesson, but in another way. Instead of seeing the glory of Jesus’ self-giving dominion through a positive example, we’re going to see his glory through a negative example. Oh wait, is that not Absalom? Let me search again…ah, that’s better. Let’s turn to 2 Samuel 14 to meet this handsome devil. 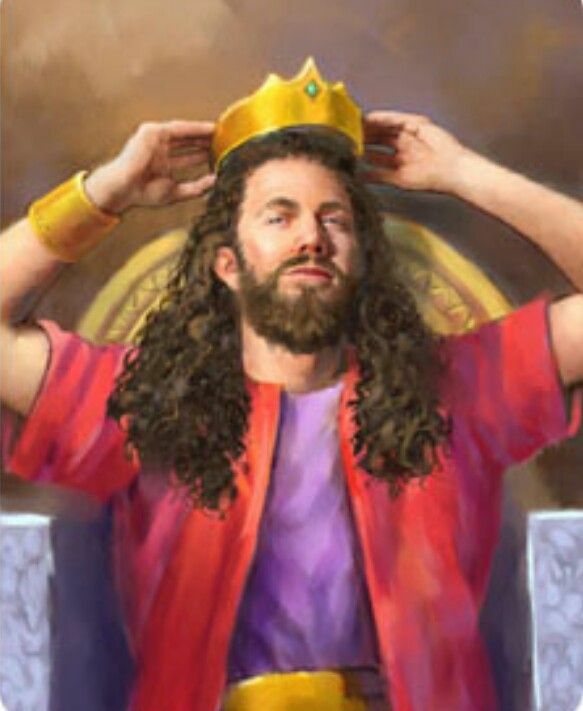 At this point, David is King on the throne over all of Israel. Absalom is his oldest son. David had two older sons, but both are now dead. Before we dig in, you need to know that the Bible spends 7 chapters on Absalom. From 13-19. SEVEN chapters! As we look at this story, be sure to ask yourself, “Why does God spend so much time telling us Absalom’s story?” I’m going to argue because he wants a very detailed picture of earthly kingship to contrast with His Kingship. So, let’s look at Absalom. David was described as a man after God’s own heart. What about Absalom? In 14.25-26, here’s what we read: 25 Now in all Israel there was no one so much to be praised for his handsome appearance as Absalom. From the sole of his foot to the crown of his head there was no blemish in him. 26 And when he cut the hair of his head (for at the end of every year he used to cut it; when it was heavy on him, he cut it), he weighed the hair of his head, two hundred shekels by the king’s weight. This is worrisome behavior, but where we really see what’s in his heart is in chapters 15-18 where he plots to overthrow and kill his father, David. Starting in Chapter 15, we’re just going to do a fly over to catch the highlights of this story while really looking at Absalom. He provided himself with a Chariot (15.1). This is an act of claiming the throne. One of his brothers will do this later in the book. Set self up as judge, threw David under the bus (15.2-4). David was judging the people’s cases, but Absalom told them otherwise. 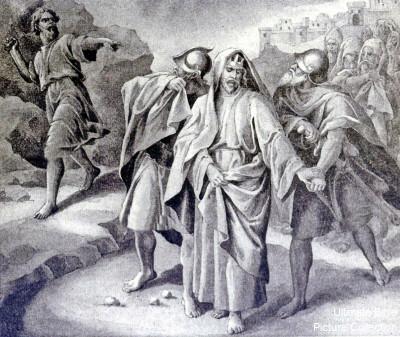 David is forced to flee for his life (15.13-14). Sleep with David’s concubines (16.21-22) to bring shame on them and ridicule to David. Seeks the life of his FATHER (17.1-4, 18.3). What does all this tell us about JESUS? Well, we saw in David’s faith in God, a picture of Jesus’, who is God the Son, trust in God the Father. David is a positive picture. And Absalom is a negative picture. To see Jesus’ in contrast to Absalom, look at Philippians 2.5-11. Notice first that Jesus was exalted to his throne only AFTER trusting His father and saving His people. BECAUSE (Therefore in v. 9) He was self-giving (vv. 5-8), He is fit to be King (vv. 9-10). HOW MUCH MORE DIFFERENT COULD JESUS BE FROM ABSOLOM? Let’s look at three ways. First is how they relate to their fathers. Absalom slept with his father’s concubines to bring shame on David, to show his contempt for David, and ultimately, he wanted to kill David. He wanted glory and dominion for himself. Jesus said things like “I’ve come to do the will of my Father. My food is to do the Father’s will. 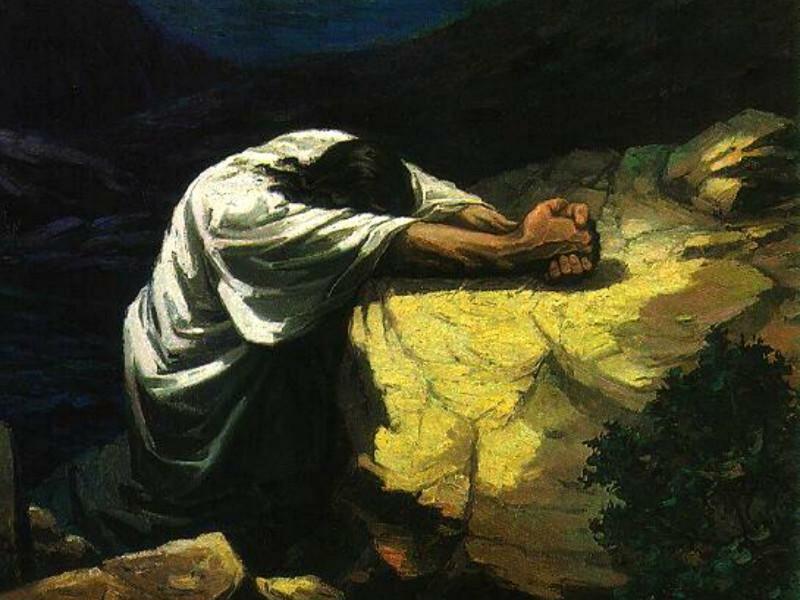 Father, not my will, but yours be done.” He wanted to give glory to the Father. He wanted to bring men and women to the Father! What about in this area of glory and name? Absalom didn’t just want glory in this life, seen in buying a chariot and riding through town to be seen and admired by everyone, but sets up a monument to himself so that even when he’s dead, people will think about him. He tries to build himself up. Jesus emptied himself. He left the glories of Heaven to come to earth. 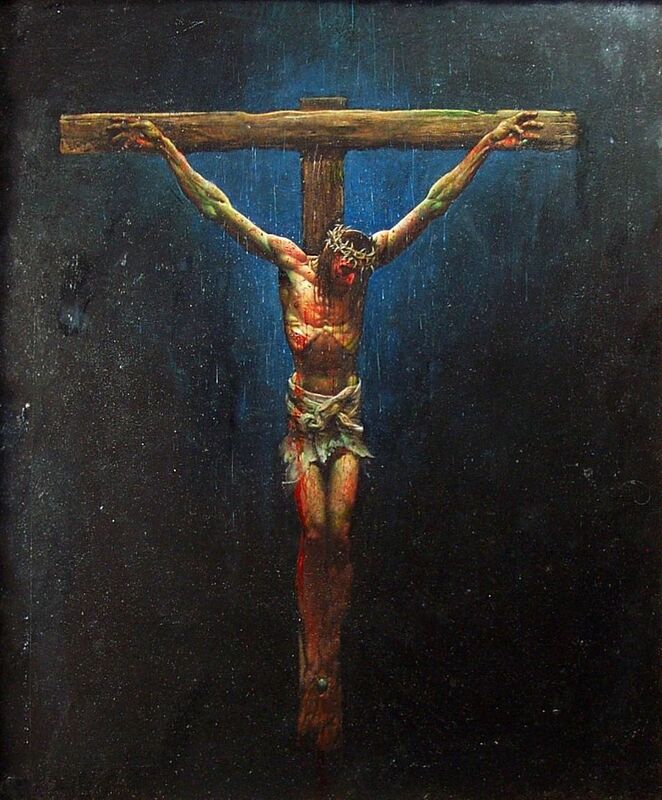 Jesus humbled himself to death on a cross. Literally emptied himself, pouring out his blood to save sinners. He was the greatest SERVANT of all. What about their judgments? Both Hung on a Tree, buried in a pit/tomb. Absalom, full of himself, is ensnared, literally, by his pride. His life said, “everyone’s life for mine”. Jesus’ act of supreme sacrifice declared, “MY LIFE FOR YOURS” from start to finish. Absalom was speared through for his own sin. Jesus was speared for our sin. 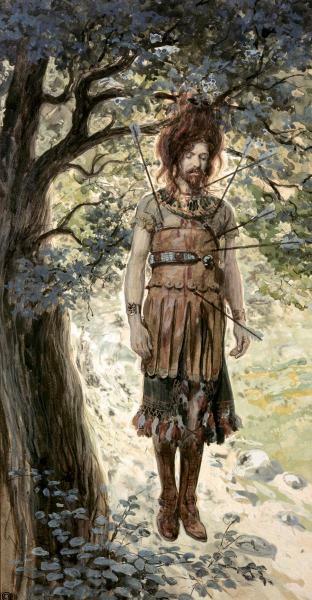 Absalom hung on a tree because of his treachery. Jesus hung on a tree to forgive our treachery. Absalom got what he deserved. Jesus got what we deserved. His life for ours. Jesus, the Lamb of God, who takes away the sins of the world! So, Absalom helps us see the glory of Christ, precisely because he is nothing like our Jesus. From the core of his being to the way he rules, our God is a self-giving, self-sharing God, and that is how Jesus came and how He continues to rule! What is Jesus’ Kingdom like? The Kingdom of God has been a topic of interest since I become a believer. In seminary, my studies in Biblical Theology afforded me the chance to really dig in on some aspects of it. I remember reading George Ladd for the first time and realizing that the word “kingdom” in both Hebrew and Greek could mean a place (England), a people (the English), or the reign of the King (During Henry VIII’s Kingdom, the Reformation began in England), with the latter being the primary use when discussing God’s Kingdom – it’s about HIS REIGN. That was mind blowing for me. One thing we did not discuss as much was the nature of the Kingdom flowing out of the nature of the King. We did discuss what God’s consummated reign my look like, but we failed to connect it to the very character of our God-King himself. The reign of God is the way it is because that is what GOD HIMSELF is like! That’s something that has been of interest to me recently. So, in this and the next 3 posts, I’m going to unpack what that means for us. A cosmic hall monitor, the govenator, dishing out divine decrees simply to flex his muscles. He’s a withdrawn, fickle, and impersonal deity, looking for whom he might smite with a great smiting…smoting…let’s go with smiting? He’s what James Torrence called “a contract god.” If you want his blessing, or at least for him not to wipe you off the face of the earth, you better perform. What they all have in common is that these are all descriptions of POWER. That’s what comes to mind. A Lord, that is, a King, that is all power and little of anything else. AND THESE DESCRIPTIONS COULDN’T BE FURTHER FROM THE GOD OF THE BIBLE. What we’ll see instead is that God’s kingship, his dominion, even when he gives law (because he does that), but everything he does, every part of his kingship – it flows from a completely different fountain. At the heart of God’s dominion is this principle: MY LIFE FOR YOURS. Think of it like this: What was God doing before Creation? Jesus said a few very interesting things. In his prayer in John 17.5, he talks about the glory that he and the Father shared together before the world existed (17.5). In verse 24, he says to the Father, “you loved me before the foundation of the world.” From all eternity past, we see fellowshipping together, sharing together, giving to each other. I’ve heard one preacher say this: “There are no mirrors in the Trinity.” Jesus isn’t checking himself out making sure he looks as good as the Father. The Holy Spirit isn’t worried that the Son is receiving more glory…NO, they are enjoying each other, giving to each other. And that is the heart of God’s Kingship. Self-giving, self-deferring, sacrificial love is THE mark of a real king because that’s the marker of the real God. But that’s nowhere near what most people think, even Christians, when they consider that God is King, God is ruler. God’s Kingship is this: MY LIFE FOR YOURS. Or we might say from our perspective “His life for ours,” “THE KING’S LIFE FOR MINE.” That is what Biblical Kingship should look like, because that’s what God’s rule looks like. So, let’s look at this MY LIFE FOR YOURS kingship in Scripture. We’re going to see that this is what good earthly rule looks like, but we’re also gonna see WAAAAAAAY more that it’s all here to point us to His rule, to our good King – King Jesus. We will see, in the end, that our God isn’t a cosmic traffic camera, willing to give us a free pass in return for good behavior and a little gratitude. No, He means to win our hearts. To WIN OUR HEARTS. So, in the next post, we’ll look at King David and how God’s character shaped his reign. The following post, we’ll look at Absalom, David’s son, as a negative example of what we’re talking about. Finally, we’ll look to Christ, and ask about how we ought to respond. These two earthly kings are going to help us see Jesus more clearly and that His reign flows directly out of His heart!